Your Favorite Cowboys In Person! As you might imagine, cowboys were always a big deal down here where I live, so a live appearance by one or more of them was cause for much jubilation --- and crowded parking lots. 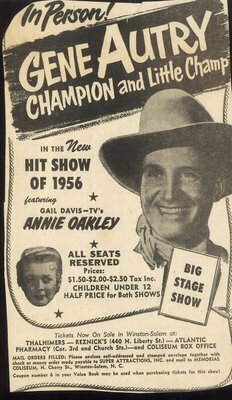 Gene Autry was all done with westerns by 1956, theatrical and TV, but hoss-opera fans have long memories, and this live Autry show at the Memorial Coliseum in Winston-Salem was major news, especially with Gail (Annie Oakley) Davis sharing the bill. Whip Wilson was a marginal name at best, but hey, for nine cents, I might watch my next-door neighbor do a stage turn if there’s a screen show to go with it (but who ever heard of Missing Women? --- that’s a new one on me!). 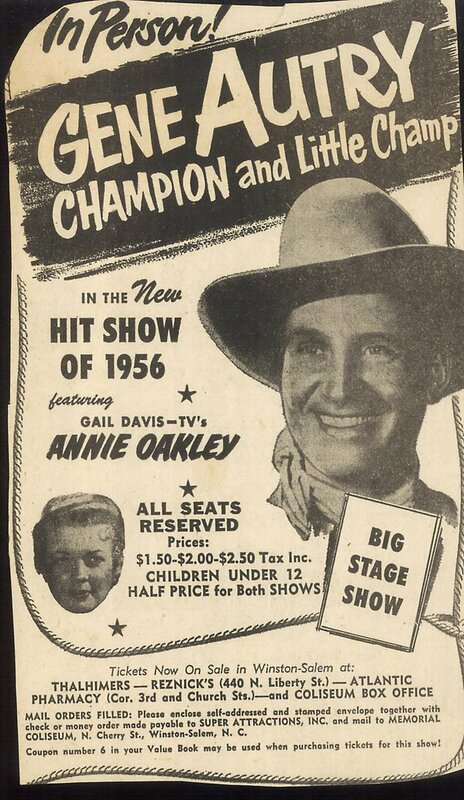 The Gunsmoke cast, minus Matt, must have lured a lot of first-timers to that horse show. Personally, I never cared for them (horse shows, I mean, not Chester, Kitty, and Doc), but I’d even risk getting my shoes ruined if I could corner old Milburn Stone and ask him what it was like working with Lon Chaney, Jr. in The Frozen Ghost. Bet they were sick of looking at (and smelling) those steeds after three days, but I guess it was no worse than sharing an asphyxiating Hollywood sound stage with them.